This is the fifth year I've listened to this, and the third year I've used it for Halloween Bingo. I'm not going to review it here, but I will link to the review I posted five years ago. I will also post this picture of Tom Mison again, because he's gorgeous. I've listened to this every year since I got it--four years now. Tom Mison is what makes this book for me. His narration is absolutely delightful. Welp, now I've read a classic. And I was underwhelmed. Soo much florid description, and not nearly as much suspense as I expected. I listened to the version by Robert Dean that is available through my library and Hoopla rather than the audio edition listed here. My third time listening to this, and I swear it gets better every time. 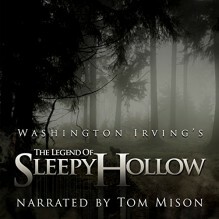 Tom Mison is a fabulous narrator, he should totally narrate more books.